January 25 is a special day for the Arubans. It's Betico Croes Day, the birth anniversary of Betico Croes, an Aruban politician activist, who advocated the separation of Aruba from the Netherlands Antilles. Gilberto François “Betico” Croes was born on January 25, 1938. He was young and ambitious politician, when he became the leader of the political party People's Electoral Movement. In 1976 he was responsible for the seal, flag and hymn of Aruba (the latter was co-written by Pady Del Caribe and Rufo Wever). In 1977 Croes was responsible for referendum, regarding the independence of Aruba. 83% of the voters voted in favor of independence. 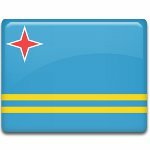 Aruba gained its autonomy from the Netherlands Antilles on January 1, 1986. The country officially changed its name to the Kingdom of the Netherlands. Aruba was given the full independence from the Netherlands only in 1996. Aruba died in a car accident in 1986. After his death he was proclaimed Libertador di Aruba. His birthday date was chosen as an official holiday to honor the great Aruban politician.